Raising the spectre of cycling being left out of the Olympic Games, Pat McQuaid has sought to make a direct connection between his re-election in September and the sport retaining its place as one of the IOC’s featured events. The comment, which some may see as an attempt to put pressure on delegates to vote for him at the UCI congress, appeared in the twenty page manifesto which he released today. 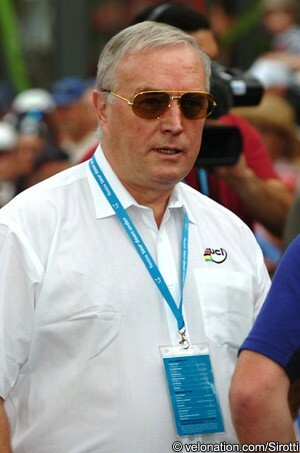 “It is of vital importance that the UCI President is an IOC member. There have been some calls in recent years for cycling to be dropped from the Olympic programme,” McQuaid wrote in his document. “I have always stood up for cycling in the face of such proposals. My position as an IOC Member has been an asset for cycling and my influence and good standing within the IOC has protected cycling’s reputation and safeguarded its place as one of the core sports at the 2016 Olympic Games in Rio. Extending the line of logic used, McQuaid appears to be hinting that a vote for his rival Brian Cookson could bring danger of the sport being dropped, despite the IOC saying on several occasions that the sport would be retained within the programme. In recent years speculation that cycling could lose its place has been based around the numerous doping scandals which have cropped up, including the Festina Affair, Operacion Puerto, Floyd Landis’ positive test, Michael Rasmussen’s expulsion from the Tour de France, the CERA positives of the 2008 Tour and the Lance Armstrong/US Postal Service affair, which included USADA’s assertion that the Texan also used banned products in 2009 and 2010. McQuaid denies the latter point. Most of those occurred after McQuaid became president, although he insisted today that he has helped to completely change the culture, and the sport. It is worth noting that the teams themselves, not the UCI, pay the bulk of that budget. The section pertaining to the first of those includes testimonies from riders such as Garmin-Sharp’s Dan Martin and Argos Shimano’s Marcel Kittel, both saying that it is possible to win clean. It also contains the pledge that the UCI would allow its past actions to be examined. “I remain committed – as does the UCI Management Committee - to conducting an independent audit into the UCI’s actions during the years when Lance Armstrong was winning the Tour de France. The UCI’s invitation to WADA to work with the UCI on this stands,” said McQuaid. Last autumn the UCI said that it would allow an Independent Commission to fully assess its dealings with Armstrong and the points raised by the USADA Reasoned Decision. However it later closed down that Commission, and as a result McQuaid’s role in the UCI’s dealings with Armstrong has not been assessed. Today’s pledge to hold an audit comes without a timeframe, but it is certain that no outcome would be reached until after the UCI elections are held. McQuaid’s manifesto also saw him repeat his pledge to make the Cycling Anti Doping Foundation (CADF) more independent. In contrast, noting that the CADF was set up by the UCI, has its headquarters in the same building and has a historic relationship with it, Cookson has said that he wants a new and completely independent body set up. If re-elected, McQuaid has said that WorldTour teams will have to increase their contributions to the CADF budget to make it more independent. In relation to the second priority outlined, McQuaid states that he plans to establish an independent UCI women’s commission, to push for equality in prize money, pay and conditions at every level of cycling, to give priority to UCI WorldTour races and teams which have a women’s component, to redevelop the women’s racing calendar to make it easier to understand and to boost the numbers of women holding decision making processes in the sport. As regards modernising the way that cycling is presented, McQuaid states that he wants to reorganise the current calendar in order to make the structure more simple and to ensure that the best riders appear at the best races. He states that he plans to share revenues more equitably with the various stakeholders, but rules out the proposed reforms of the so called ‘breakaway league,’ something which he at one point seemed open to. “While I will encourage working with investors to ensure investment in new races and the UCI World Tour, I will oppose the establishment of private leagues or a World Championship,” he stated. He also said that the UCI would now embrace technologies which it previously outlawed such as cameras on bikes and helmets. Reforms and simplifications of the WorldTour points system and team selection has also been promised. As for the final priority, the global development of cycling, McQuaid has outlined the creation of the global WorldTour as a big aspiration, as well as naming other targets. Responding to the document, Cookson said that the volume of promises and pledges contained within it served to illustrate not what should be done in the future, but what should already have been completed in the past. “Pat has been President of the UCI for two terms. While his Manifesto outlines what he believes still needs to be done for the UCI, I think that many people will judge him on his record, and ask why those things haven't been done in the last eight years,” he said in response. “Unfortunately under his Presidency far too much energy and resource have been devoted to destructive feuding and conflict rather than grabbing hold of the issues, listening to the right people and delivering solutions. McQuaid was himself critical of Cookson’s manifesto, which was released on June 24th.